That the safety and welfare of children should always be of paramount importance, whatever the circumstances. That everyone with a role in working with children has a moral and arguably a legal responsibility to safeguard and promote a child’s welfare particularly when it comes to protecting children from abuse. That special care is needed in dealing with children whose age, inexperience or physical state makes them particularly vulnerable to abuse. 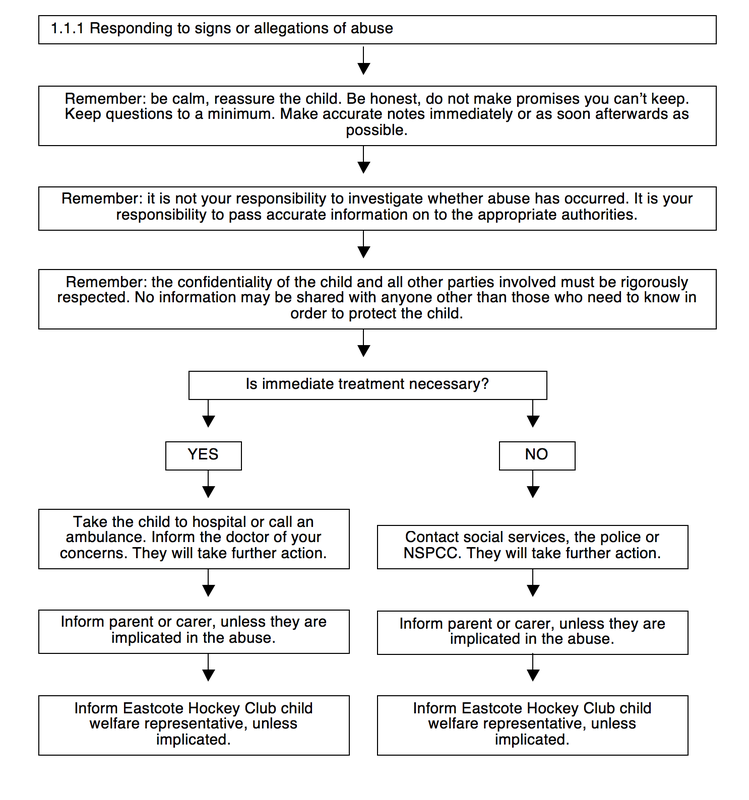 Has therefore adopted these Child Protection Policy and Procedures to ensure that the welfare and safety of children in Eastcote Hockey Club’s care is always the primary consideration. Is committed to providing an environment where children can learn about, participate in and enjoy hockey free from harassment or abuse. A child’s welfare is the paramount consideration. A child has a right to be protected from abuse, regardless of age, ability, gender, racial origin, religious belief or sexual orientation. The Children Act 1989 states that anyone who is involved in the care of children should “do what is reasonable in the circumstances for the purpose of safeguarding or promoting the child’s welfare”. Hockey is one of the most popular sports played by young people. It is important that all people taking part in the game are exposed to positive experiences and protected from negative ones. The role of the coach within the sport is a very important one. The coach is any person who is responsible for the development of an individual or group of individuals within the sport. As well as the sporting development the coach is tasked with the all round development of the player, or group of players, within the sporting context. The coach is the mentor, the confidante and the teacher, and they must therefore demonstrate exemplary behaviour at all times. The coach also has to maintain this level of behaviour when dealing with parents, assistant coaches, managers and other personnel involved in the sport. Coaches who accept and work to the guidelines within this document are accepting responsibility to the players they coach and their families, to other colleagues within the sport and to Eastcote Hockey Club. Should the coach’s application of the Code of Conduct be called into question, Eastcote Hockey Club management committee will deal with it in an objective and confidential manner. Personal appearance is of great importance when coaching, and although individual taste will effect differences in appearance, the coach has a responsibility to look clean and project an image of functional efficiency at all times. Coaches should never smoke while coaching. Coaches should try and avoid chewing gum whilst coaching. Coaches should never coach under the influence of alcohol. Coaches should avoid using profanities during coaching sessions. Consistently project a favourable image of the sport and of coaching to the players they are working with, their parents/families/guardians, officials, spectators and the general public. Make sure that the level of activity carried out by the performers is suitable for their age, strength, maturity and the ability of each individual performer. Encourage appropriate behaviour by the performers during both training and competition. Encourage the performers to abide by the rules of the sport. All performers should be encouraged to uphold the spirit of the sport. Make a positive effort to educate the performers as to the improper use of substances that are on the sport’s banned drugs list. Help the performers to deal with victory and defeat in a sportsmanlike manner, and encourage them at all times to treat opponents with due respect. Coaches have a responsibility to set and uphold the boundaries between a working relationship and friendship between themselves and the performers. This is especially important when the performer is a young person. Coaches must be concerned at all times with the safety and well being of the performers. There should be a sensible balance between performance and the emotional, physical, social and developmental needs of the performers. If any part of the coaching process requires physical contact between coach and performers, it is recommended that coaches ensure that no action on their part could be seen as inappropriate. It is essential that all coaches are aware and adhere to Hockey England Limited’s (HEL) guidelines with regard to such situations. Coaches will, in the course of a working relationship, gather much information about performers. It is important that an appropriate degree of confidentiality is maintained and that personal information is not divulged without the permission of the performer. Coaches have a responsibility to make sure that performers have a safe environment to work and play within. If an accident occurs it is recommended that coaches follow the steps laid out in the HEL ‘Health and Safety Policy’ document. Coaches have a responsibility to protect children from any form of abuse during training sessions, competition and whilst in their care. It is helpful if coaches clarify the level of commitment expected from performers at the outset of any agreement. Details should include number and length of sessions, attendance at matches or competition, fees and method of payment. Coaches must respect the rights of every human being they work with, and treat all as equals within the context of their activity and ability. This must be regardless of age, ethnic origin, gender, religion, sexual orientation, cultural background or political affiliation. Coaches should try and ensure that any activity under their supervision is free from any form of non-equitable behaviour.